It’s been quite a while since we’ve seen anything Shining related here in the west, the last game being a 2016 fighting game featuring characters from Shining games that were never localized, Blade Arcus from Shining: Battle Arena. Before that, despite the constant release of Shining games in Japan on PSP, Shining’s presence in the west more or less disappeared after the release of Shining Force EXA for the PS2 back in 2007. 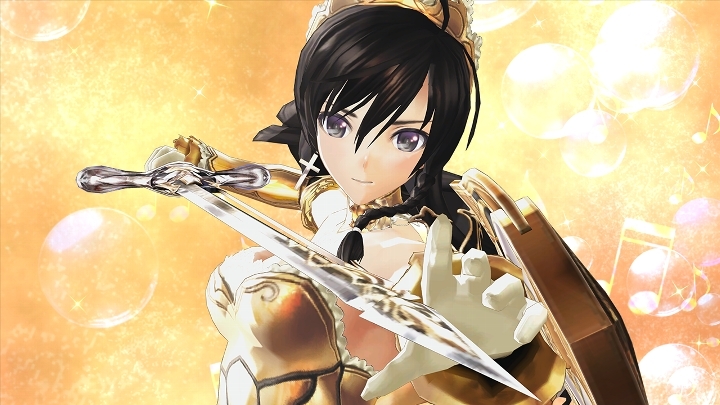 That said, Shining moved back to consoles in 2014 with the release of Shining Resonance on PS3. That version wasn’t localized, but it has been remastered for current generation consoles. 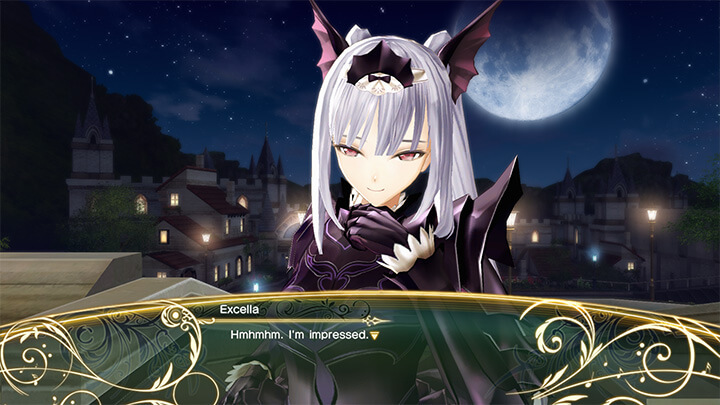 The game’s story comes in two flavors: original mode, and refrain mode. Original mode is more or less exactly how it sounds; play the original version of the game with all of the new enhancements. 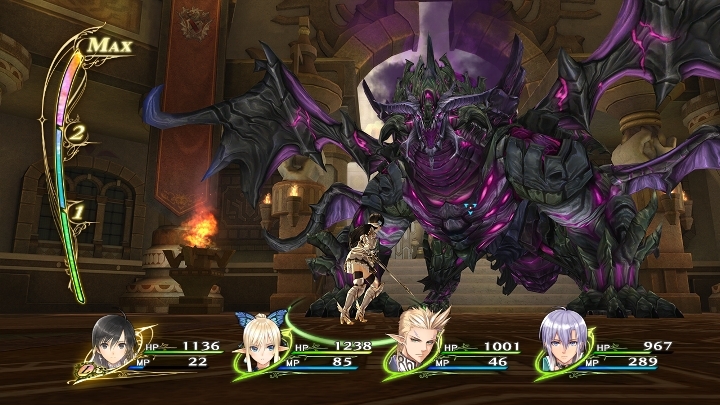 Refrain mode can be thought of as “New Game+,” as it adds 2 major enemies in the game as party members and the mode itself expects you to have beaten the original mode first for spoiler specific reasons. Regardless, you follow the story of Yuma, a character with an unfortunate past. At a young age he lost his mother, but even before then, he became a vessel of the Shining Dragon. The Shining Dragon is the strongest of all dragons, and since Yuma can’t control its power, summoning and losing control of it would lead to certain disaster. Because of this, Yuma is timid by nature and does not want to fight; even if forced into it, he refuses to use the dragon. In the beginning of the game, Yuma is captured by the Empire of Lombardia and is tortured day in and day out with the hope that he’ll break. Hoping to use him as a tool to end their decade-long war with the Kingdom of Astoria. Hearing of the Shining Dragon’s capture, Astoria gathers a small crew together and breaks him out. Upon his arrival at the castle, the king asks for Yuma’s help in the war against the Empire as to which Yuma agrees. Ultimately speaking, this is the story of a coward who slowly, but surely, will become a hero. The lore of Alfheim, the continent the game takes place, is very rich. Between the stories of the war with the Dragons and the Dracomacina (Dragon x Machines), the stories involving the Shining Dragon, and King Albert’s and Captain Burroughs’ war stories, you really have to wonder what’s real and what’s fake because all of it is just unbelievable. Outside of the lore, the rest of the game sort of falls flat. Simply put, the game just isn’t fun. The first big criticism that comes to mind is the characters; they’re all cardboard cutouts of the usual tropes, resulting in them being incredibly boring. Whenever disaster strikes, the characters don’t have enough depth for me to even care about them. With that said, there are some great characters. Agnum is absolutely hilarious, and Princess Excella of the opposing empire is someone I could support, given her motives and what she’s trying to accomplish. Everyone else just feels like they’re there to fulfill a role in the story and I can’t get behind that. There is only one town in the game. Typically speaking, that isn’t an issue. But the town doesn’t really evolve throughout the course of the game. Of course, there are a few things to do in Marga, as this is your main hub. The worst thing about this game for me is that there is no fast travel. Granted, the world isn’t all that big so it would take a few minutes to get where you need to be. However, when the game asks me to go somewhere, then go back to town, only to go back to the same spot I was before, it does become a tad-bit frustrating. Especially when the game does give you designated campfire sites for you to rest and heal up and continue on with the adventure. Speaking of the world map, both small and large enemies will appear on it. When near an enemy, you’ll go into battle with it. Small enemies tend to have multiple enemies appear with it, whereas going into battle with a larger one may just be that one monster. Fighting these monsters can be pretty in-depth, as their attacks alone come in three varieties. Normal attacks are just that: normal moves with no flashiness to them. Break attacks are a secondary type of attack where the main focus of it is to break the enemies defenses. Magic attacks, meanwhile, all vary from character to character. Normal and break attacks cost stamina and magic costs MP to use. MP can be regenerated by hitting an enemy with your physical moves whereas stamina is restored overtime. While that is the basics of it there are quite a few things to consider. Remember the bit about personality traits I mentioned you gain from watching events? Well, those play a role in battle as well. Depending on what personality you and your other teammates have will depend on how they support each other in battle. Some focus on statusing an enemy, some may be more aggressive towards enemies, and so on. Beyond personalities, Yuma has a special ability that allows him to temporarily use the power of the Shining Dragon. It’s incredibly powerful in combat and it will decrease the MP usage for your party. If used correctly, you can dominate an enemy 15 levels or more ahead of you. There is a huge drawback however, as while you’re in this form, Yuma’s own MP will deplete over time. The lower his MP is, the higher chance he has of going berserk. If you go Berserk you won’t be able to use Yuma until he reverts back to his normal state. That said, him going berserk could be potentially very dangerous as he will strike everything in his path. Now, the key to using the Shining Dragon is to actually use it while in a B.A.N.D session – the Battle Anthem of the Noble Dragoneers. While jamming out, the Shining Dragon won’t go Berserk and depending on who is the center of the BAND, as well as the song being played, buffs will be applied for your team. The session only lasts as long as you have the meter for it which depletes very quickly. Another way for the BAND to end is for the center to faint while in battle or if you decide to end it yourself. In essence, battles aren’t complicated to play and the overall game is never too difficult, although some bosses will remind you from time to time that you do have to block and not just tank every hit. Which does go into the only nitpick I have in regards to battles: The game does not have a hotkey to open up and manage items while in battle, nor the ability to switch characters on the fly. If you need to do either of those things, you need to go into the main menu to do so. On the brightside, once the battle has ended, and depending on your party, a different winning jingle will play, which is pretty cool. Speaking of music, the game has quite the variety of tracks. 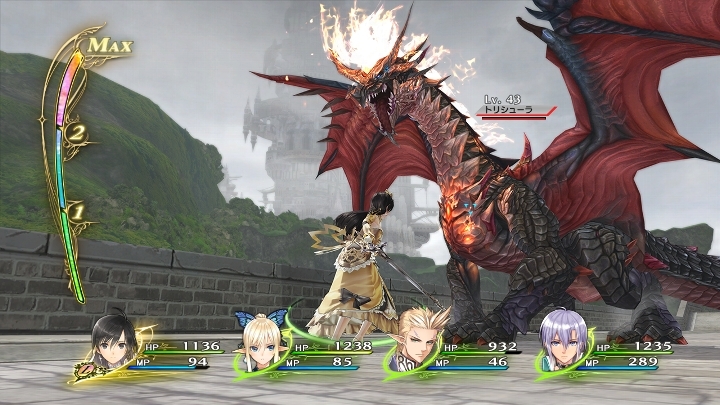 Music is a major part of the game’s lore as the weapons your party members use are actually instruments created by the Shining Dragon. The game makes this very important as most of the tracks in the game are composed of the weapons you have. As I mentioned earlier, who you have in your party affects the winning jingle that plays, but it affects other things as well such as a music heard while in BAND. The center’s instrument really does take center stage. In terms of upgrades from the original game to Refrain, the game is now 1080p and 60fps on base PS4. It is unknown what improvements are on PS4pro and Xbox One X. However, while playing on Pro characters like Agnum can tank the framerate due to the nature of his magic attacks. Same with another character you’ll get later in the game. Other than that, the framerate doesn’t miss a beat. Considering SEGA meant for this entry to be a reboot for the franchise, this overall is a pretty mixed bag. The lore and overall storytelling they have in place is good. It’s just that they need more interesting characters. The battle system is just fine, except using BAND + Shining Dragon breaks everything very easily. How the soundtrack is implemented into the gameplay is a really nice though. Hopefully by the time we get the next entry, some if not all of the kinks will be ironed out. This franchise certainly has what it takes to come back. Posted on July 9, 2018, in Reviews. Bookmark the permalink. 2 Comments.